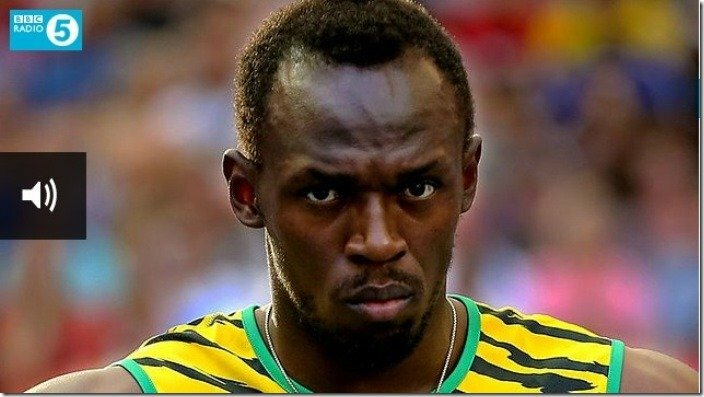 Usain Bolt was in England to promote his latest book Faster than Lightning: My Autobiography . This is actually his second book, as his first book was titled Usain Bolt: My Story: 9.58: Being the World’s Fastest Man . BBC’s Mark Pougatch had Usain Bolt for a special hour talking about his life and career. The show is 2 hours long, so ignore the last hour. As well, you’ll have to ignore the headline news “on top of the hour”. You can view video clips of this segment on the BBC website. Click on this link, the image below, or use the podcast widget to listen to download the show. The show was recorded Sept 19, and will be on the website for 7 days.